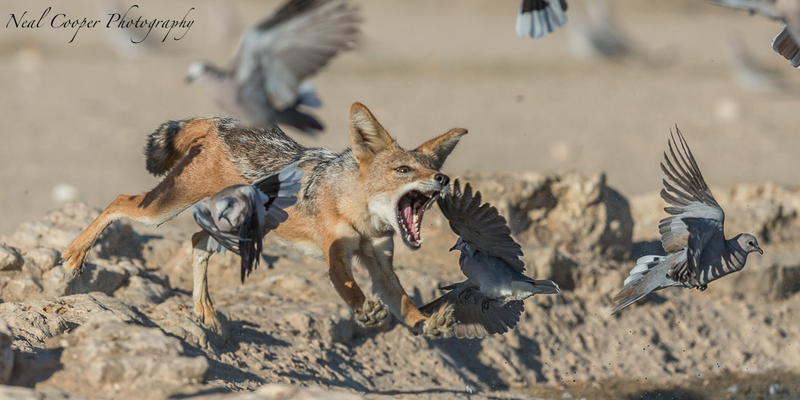 One of the Kgalagadi sightings I have always wanted to photograph is when the Jackals hunt the Cape Turtle Doves and Sandgrouse. I have visited the Kgalagadi Transfrontier Park 13 times in the last few years and have always dipped on seeing this action. 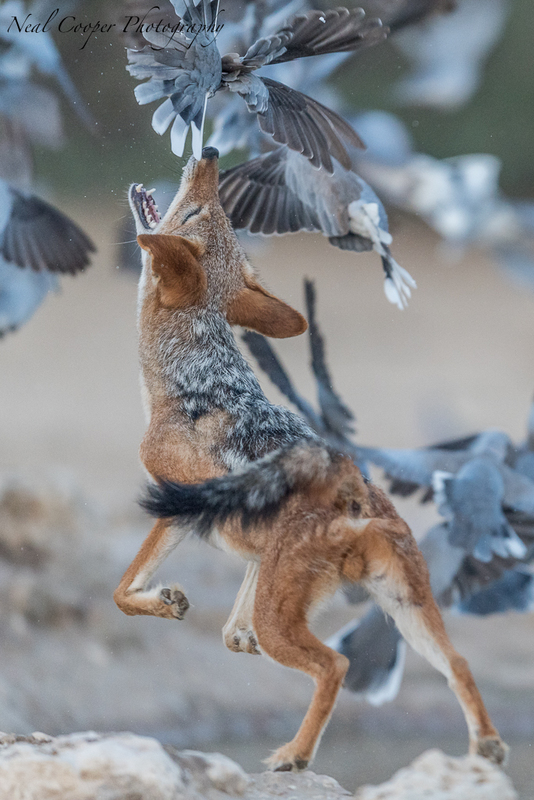 From what I could gather on the various reports and sightings from other frequent visitors like Tobie Oosthuizen the jackals use the Kwang and Cubitje Quap waterholes, both North of the Nossob camp, for their ambushes on the birds. 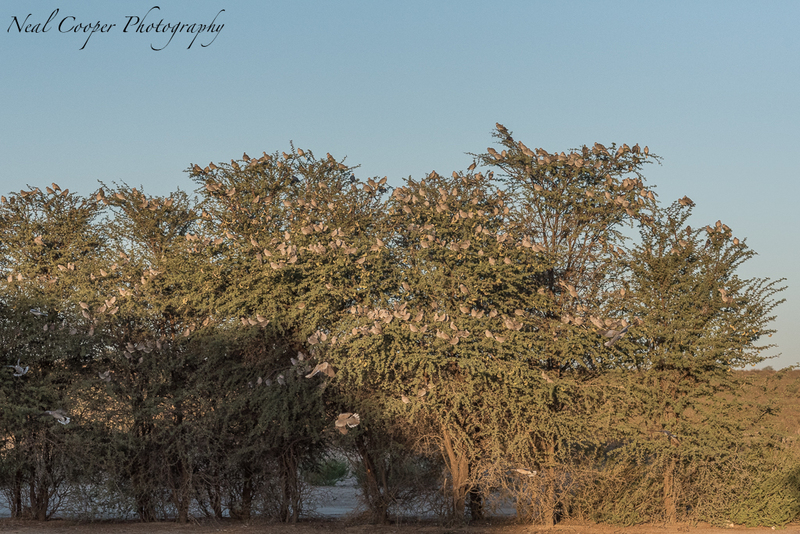 So when I decided to go back to the Kgalagadi, with my friend and fellow photographer Niel Goslett, in mid January 2015 one of the areas I wanted to focus on was to try and get some action shots of this activity so I booked us in at Nossob for 3 nights. 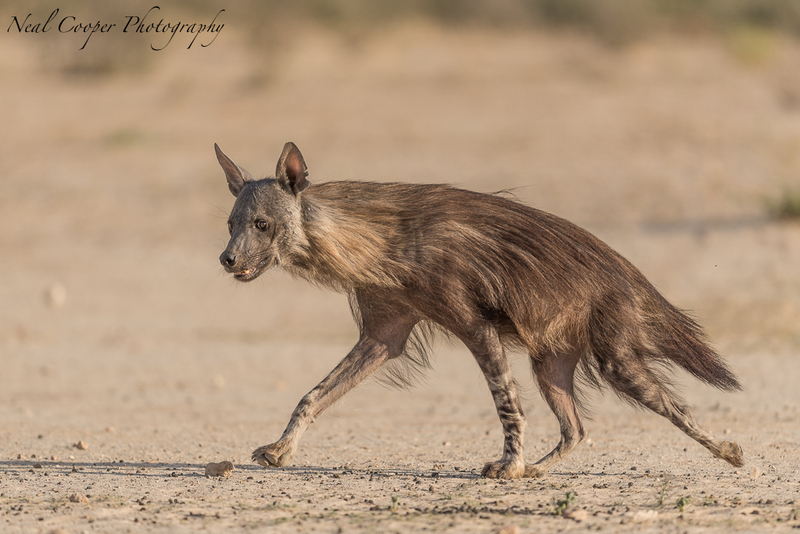 We were not to be disappointed as on the first afternoon’s stakeout at Cubitje Quap, no Jackals or Sandgrouse, but a visit by a Brown Hyena who got into the waterhole and had a bath, then walked over to some loose sand and took a dust bath before returning to the waterhole for a drink. A Brown Hyena approaching Cubitje Quap waterhole. The Hyena was so relaxed and we enjoyed photographing it up close. On the following 2 mornings the action was hot. The tactics employed by the few jackals we witness in these ambushes varied. Firstly, a single Jackal would wait in a shady spot just beyond the waterhole until the Cape Turtledoves defended in their masses before slowly creeping forward and then charging over the low rocky wall of the man made dam, surprising the drinking doves. It only managed to get a mouthful of tail feathers on one attempt. The Jackals would also hang around the waterhole and pretend to be asleep or disinterested in the activities of the birds and then suddenly charge forward. 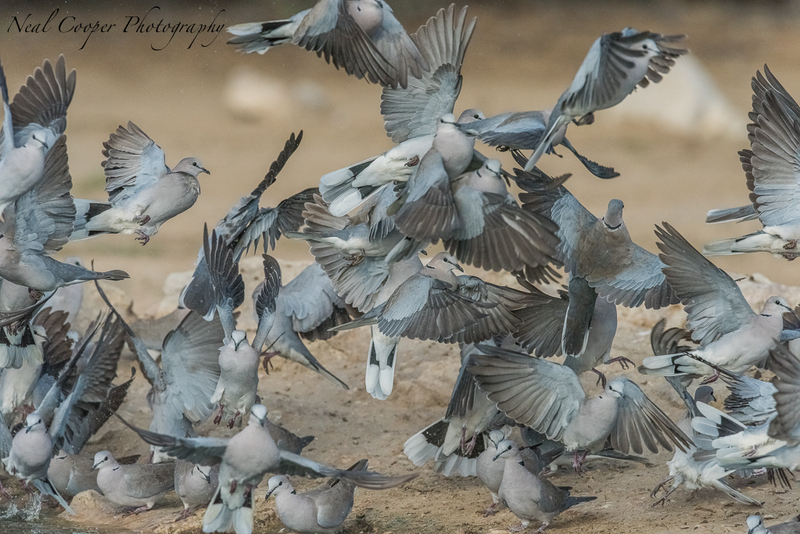 The photography was difficult as the first assaults were made before the sun had reached the waterhole and with nearly every attack there were so many Doves in the way that the Jackal’s head was obscured. In addition to the Doves obscuring your view, the approach and attack speed and direction varies so much as the Jackal charges that a lens with a bit less focal length is required. 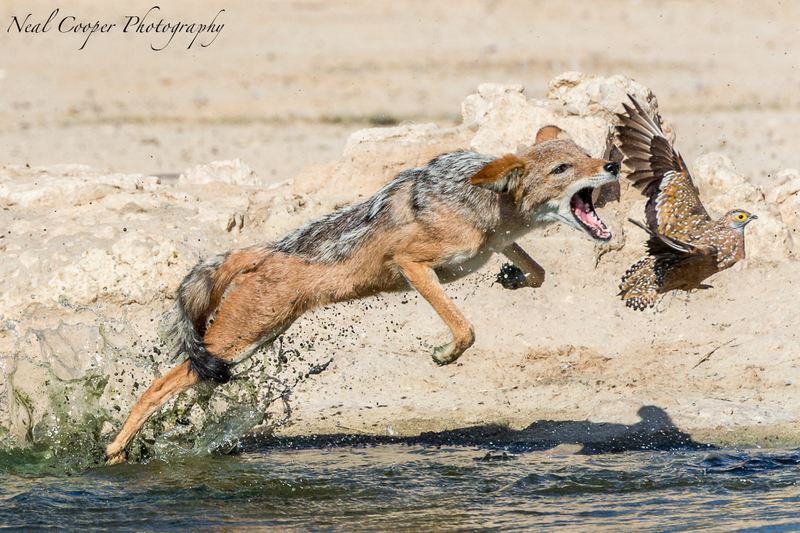 I used my Nikon 400 f/2.8 and my 70-200mm with 1.4 extender depending on where the Jackal was attacking from. Luckily for us it launched numerous attacks but without success. 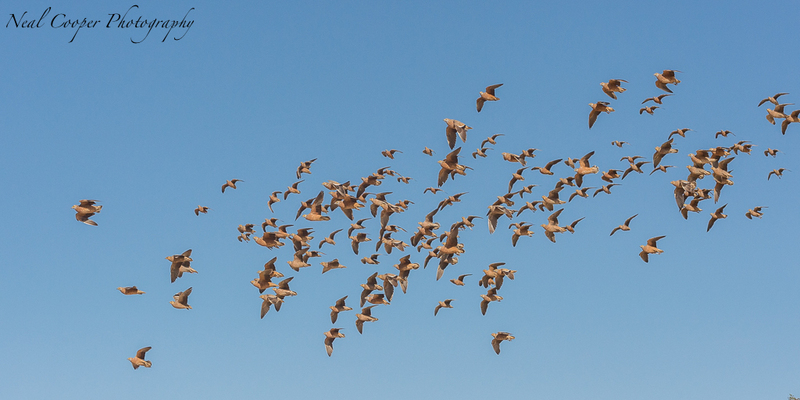 As the Turtle Dove had quenched their thirst the Namaqua Sandgrouse arrived in small groups, announcing their arrival from afar with the unique “kelkiewyn” calls. I thought this was going to be the game changer for the Jackals as the Sandgrouse would squat down in the water to douse their feather in water which they then carry back to their young at the nests. This added weight would make then a fraction slower on the take-off thus giving the Jackals an advantage. But it was not to be as they Sandgrouse left the Jackals grabbing air on every occasion. When the Burchell’s Sandgrouse arrive they flop straight into the water, making for some great take off shots as they exit the water. A second Jackal arrived one morning and this individual was much more aggressive and went in straight at the Doves and Sandgrouse time after time again as soon as a few had gathered at around the water, but without success. On the second morning there was again one individual who after a few attempts managed to grab a Cape Turtle Dove as it was exiting the water. 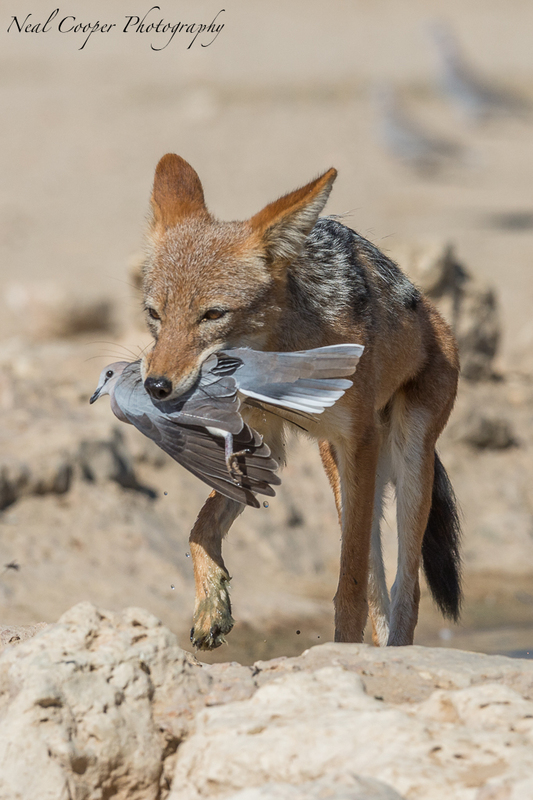 Once again I had a frame full of grey Turtledoves but managed to get the Jackal with the Dove in its mouth. 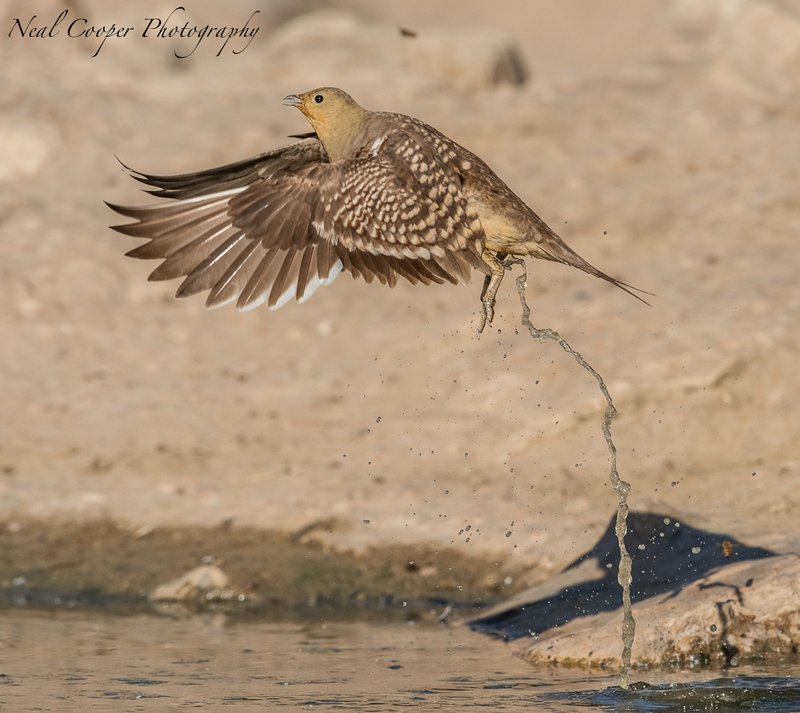 They best images of the session came in one attack on the Burchell’s Sandgrouse as one individual was lagging behing in exiting the water. The Jackall came very close to snatching it but was unsuccessful. I was just pleased to get a few clean frames of the action. From what I have read on Corlette Wessell blog the Jackalls at Kwang use a slightly different attack strategy as they would hime in the shade of a log and then charge the birds as they drink. In addition to this action we were also treated to another visit to the Cubitje Quap waterhole by the same Brown Hyena we saw on the first afternoon as well as Gemsbok, Wildebeest and many other bird species. If it’s not difficult enough focussing on the Jackals, the Lanner Falcons also use the mass accumulation of birds to launch their own strikes. We saw a number of unsuccessful as well as 3 successful strikes during the time we spent at the waterhole. Who needs to chase after the big cats when you have all this action happening which makes for world class photography. I used my Nikon D4 and D810 bodies on my Nikon 400 f/2.8 and Nikon 70-200mm lenses. Neal wonderful action images. I fully agree, this kind of wildlife interaction is much more interesting than big cats lying around. Thanks Mike. See you on safari soon. Hi Mike. Yes certainly more entertaining than the sleeping cats. Excellent pictures! I put this link on my Simba 4×4 Tours and Safaris FB page! Fantastic Blog and images. Neal are you using the new 4002.8? Jakes. No this was my Nikon D4 and 70-200mm plus 1.4 combination. Shot at 280mm. What fantastic captures…. need to get back there soon… being in Kathu I’m close enough and should have no excuses…. Ja ons het ‘n paar speciale sightings gehad. Ek sien uit om jou op ‘n Chobe trip saam met ons te he. newbies. May just you please extend them a bit from subsequent time? Thank you Mezo. May I ask which areas you would like me to expand on in future posts? Please keep in mind that many of the posts are done while on safari with very limited and slow internet, so I need to keep it short. Please engage with me and I will clarify or expand on anything your require more information on.